My reasoning is direct and straightforward. I believe it is better to increase the income of Americans through an American-centered energy program than it is to send the money to Venezuela, Saudi Arabia, Iran and Russia. An American-centered energy strategy is better for our economy, better for our balance of trade and better for our national security. With the American potential in oil and gas (offshore, through new gas discoveries, from oil shale and through enhanced oil recovery), the massive American wealth in coal (27 percent of the world’s reserves), the potential for nuclear and other advanced technologies (including wind, solar and hydrogen) and the use of ethanol it should be possible for America to be virtually independent of dictatorships as a source of energy. Ethanol has a legitimate role in energy production. Modern agriculture is becoming more and more efficient and less and less damaging to the environment. Modern no till systems combined with advanced genetics are creating corn supplies that will have amazing potential for economic enhancement across rural America. In this scientifically driven system we are better off to create a robust bio-energy industry than we are to pay farmers for doing nothing with what will become surplus land. The combination of modern biofuels with modern agricultural productivity and modern refining systems has created a remarkably robust and desirable industry for rural America. There are economic arguments on the other side. There are those who would prefer to send the money to Venezuela or Saudi Arabia. There are those who are indifferent to American national security or to jobs in the American economy. However those arguments are dead losers in the current political environment. A pro-American jobs policy will be appealing. Ethanol is such a policy. A pro-American national security policy will be appealing. Ethanol is such a policy. 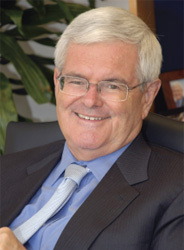 Former Speaker of the U.S. House of Representatives Newt Gingrich is founder of The Gingrich Group and advisor to Growth Energy.